*This review contains some spoilers for 1935’s She, though I’ve avoided spoiling the ending. 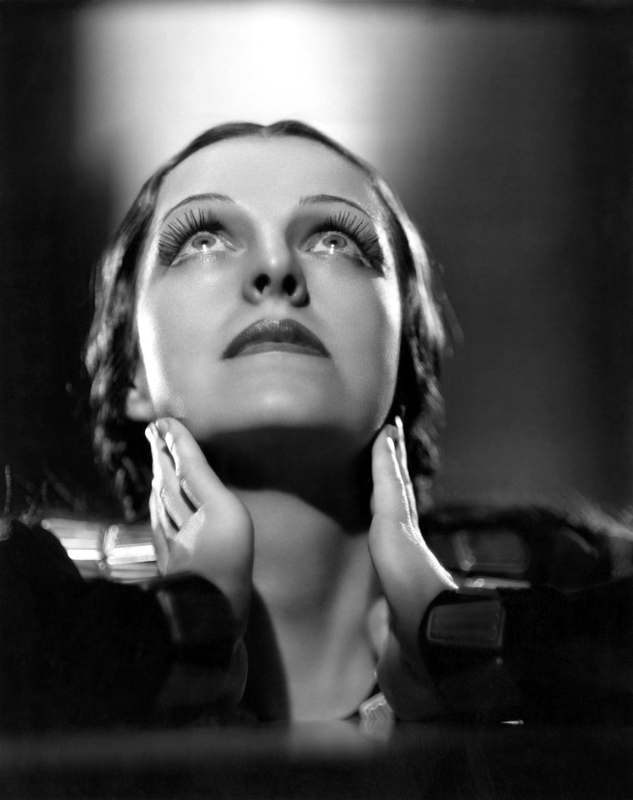 Helen Gahagan: stage actress, politician, wife of Melvyn Douglas and ruler of Kor. Leo Vincey (Randolph Scott) has traveled from America to England, where his uncle John (Samuel Hinds) is living in failing health at the family’s ancestral estate. Upon arrival, John and Horace Holly (Nigel Bruce) convince Leo that one of their ancestors (also played by Scott) discovered a fountain of youth 500 years earlier. Leo and Holly set out to find the fountain of youth using the ancestor’s old diary as a guide. They’re helped along by a man named Tugmore and his daughter Tonya (Helen Mack), traveling through frozen and dangerous lands. On their journey they find an ancient city known as Kor, where they’re attacked by cannibalistic natives. 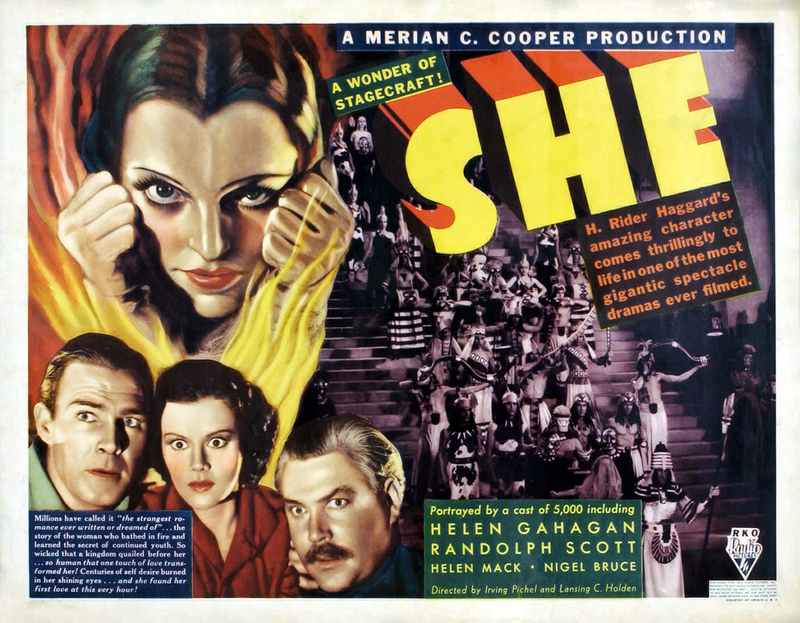 Luckily, they’re saved by She Who Must Be Obeyed (often referred to as simply ‘She,’ the film’s title character, portrayed by Helen Gahagan) before the cannibals kill them. ‘She’ becomes convinced upon meeting Leo that he is a reincarnation of his ancestor, who was her lover. ‘She’ is immortal thanks to the Flame of Life (no sparkling, clear water fountains of youth to be found), and vows to make him immortal so they can rule Kor together. Will she convince him, or will he remain mortal? She was released in 1935 and directed by Lansing C. Holden and Irving Pinchel. It is credited as being based on the novel of the same name by H. Rider Haggard, but it combines elements of all of the novels in Haggard’s series. It was adapted for the screen by Dudley Nichols and Ruth Rose and released by RKO Pictures. Interestingly enough, She only exists for our viewing pleasure because Buster Keaton had a copy of the original print in his garage and donated it for preservation. It was considered lost for many years prior to the discovery of Keaton’s copy. Having known very little about the film before watching, She was not at all what I thought it would be. I expected more of a horror or sci-fi film, and while there are elements of these genres at work, it’s overall more of a fantasy/adventure (especially in the beginning, before it becomes a mish-mash of genres), which threw me off a bit at first. But genre confusion aside, the film is enjoyable to watch in a “so bad it’s good” way. If you’re looking for a serious adventure film I’d suggest looking elsewhere, because this one’s full of cheese. The performances aren’t 100% believable, the dialogue and special effects are unintentionally hilarious, and the representation of the “uncivilized” natives is incredibly stereotypical. This makes for an odd viewing experience, but if you’re the type of person who enjoys “bad” films you’ll get a kick out of it. She is very, very far from masterpiece quality and no viewer should go into it expecting something great. One thing that is very successful about the film is the set design and some of the costuming. One of the costumes used for the character of ‘She’ served as the inspiration for Disney’s Evil Queen in Snow White and the Seven Dwarfs (1937). ‘She’ lives in the city of Kor, which is displayed as an elaborate, art deco dream world. Kor is highly stylized and beautifully constructed, with loads of visual interest and appeal. It almost looks like a mix of stereotypical ancient Egyptian influence and a rich New Yorker’s chic apartment in the 1930s. It sounds kinda exciting, despite its flaws. Great post! Next Next post: Happy birthday, Ann Blyth!